News - Pole Position Travel - Assen MotoGP 2018 Launched! The longest-standing fixture on the MotoGP circuit is back, and of course so are we! We have a perfectly formed package in the town of Assen itself and have repeated the very cool Bungalow package we introduced last year - just 15 minutes from the track and home to many teams. Even when the weather is bad, Assen is great! Rain or shine, you can count on great racing, as the last three years have proven. This is an event which sells out always, and that includes us. Our City Package in a 4* hotel in Assen, a 15 minute walk to the street party and an easy coach to the track; and our Bungalow Package in a superb park 15 minutes from the track, and featuring excellent restaurants, pools, game rooms and more. If we can drag you away from this, trackside we have most ticket options as well as the great VIP Village. This is an event to savour the Team Experience and see MotoGP from the Inside; as the paddock doesn't get as manic as the Italian and Spanish rounds. Join us with a MotoGP team and you will get to go ON the service road of this iconic circuit! Our opening dinner Friday always includes a few young riders and MotoGP insider David Emmett of motomatters.com. Always fascinating. And Sunday night, back by popular demand! 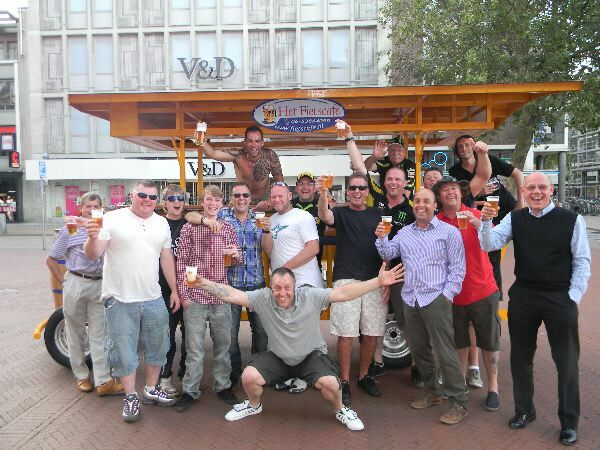 - we reintroduce the legendary Beer Trolley! A great way to finish a great weekend!